This report, which expands on an earlier report published in November 2008, forms a key part of the evaluation programme created by the CSC, with funding from DFID, to assess the long-term impact and outcomes of its awards. 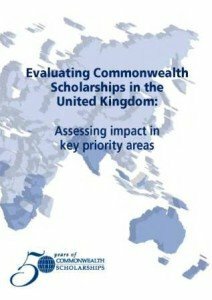 Its purpose is to provide a summary of the findings of our recent alumni survey, and to identify the impact of some of the 16,000 alumni who have held scholarships and fellowships offered by the CSC in the UK. Published for the 17th Conference of Commonwealth Education Ministers (17CCEM) in June 2009.